Life Before the Dinosaurs: Odaraia. 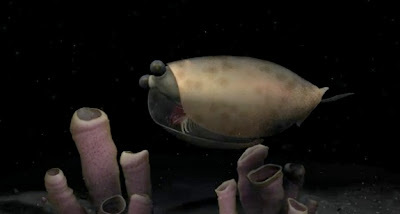 Odaraia (oh-duh-RAY-uh) was a bizarre-looking creature that has been found only in the Burgess Shale. Charles Doolittle Walcott described this animal in 1912. The species name is Odaria alata, which is the only known species, except for a possible member of the genus from the Chengjiang in China, Odaraia? eurypetala. 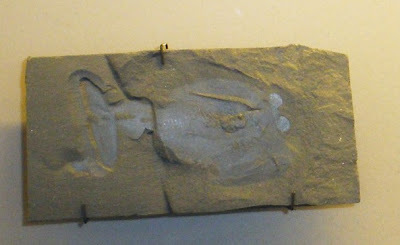 Although Odaraia may have had four eyes, this is still disputed because the other two eyes on the fossils may have been something else. Odaraia was first described as a crustacean, although it is now believed to have been a stem group arthropod. Odaraia presumably lived by swimming upside down in the water column as it searched for prey, which it sifted out of the water with its legs and ate. One of its most notable features was its three tail fins, which helped it stabilize in the water. 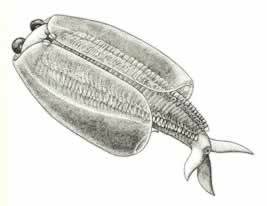 Odaraia had a large carapace that covered a fair amount of its body, including its legs. This meant that it would be impossible for Odaraia to walk on the bottom of the ocean, but it would be easy for it to swim. The Cambrian Fossils of Chengjiang, China: The Flowering of Early Animal Life, Blackwell Publishing, pg. 142. Many thanks to LBtD fan Kamakanui for this generous gift! this is amazing prehistoric scientific animal that were dealing with.